The Saab J-35 Draken was a Swedish fighter aircraft built from 1955 till 1974 and was meant to replace the Saab J 29 Tunnan. It was able to reach speeds over mach 2 and many variants were created, including a two-seater version. The aircraft also proved to be popular outside Sweden and was exported to the Austria, Denmark and Finland. The Draken can be considered an odd aircraft thanks to its double-delta wing configuration and is the most successful aircraft to use this configuration, as most others were left out in the prototype stage or only saw a limited production run. 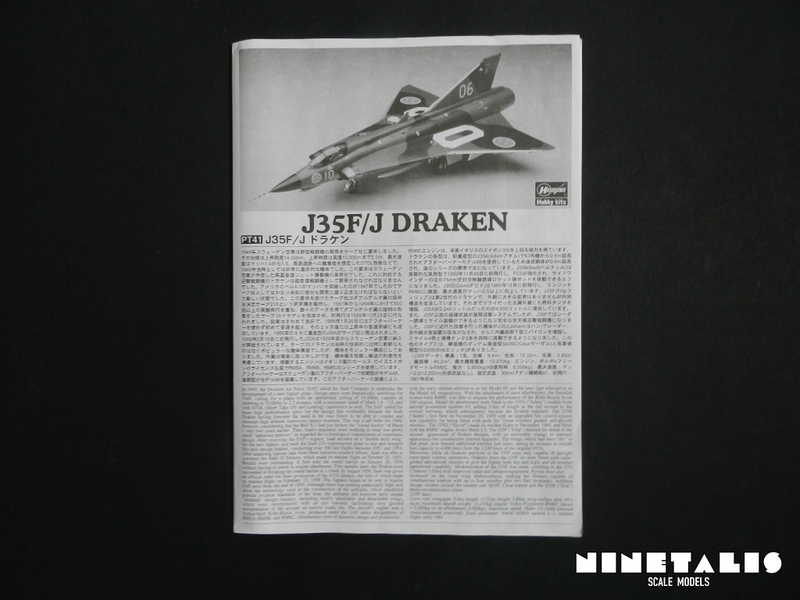 The Draken usually had one or two 30 mm cannons, sporting 100 rounds each. Besides that it had various hard points where it could carry air-to-air missiles, bombs ranging from 55 to 1000 pounds and drop tanks. Although the Draken never really saw combat, the aircraft proved itself as a good fighter, being in military service until 2005 in Austria. Some Drakens were acquired by the National Test Pilot School in the USA and are still in service today. This article is partially based on information found at wikipedia, 15th march 2015. 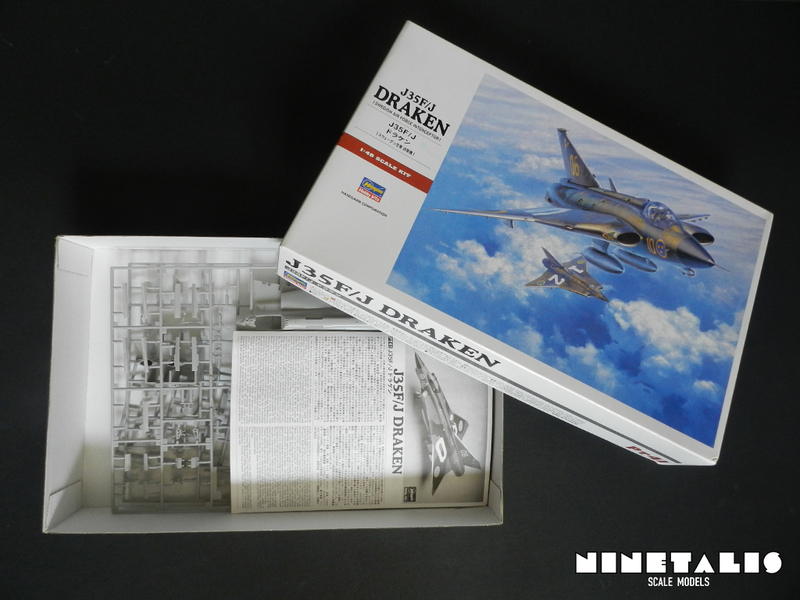 The box is made from the usual thin (yet strong) cardboard that Hasegawa uses. 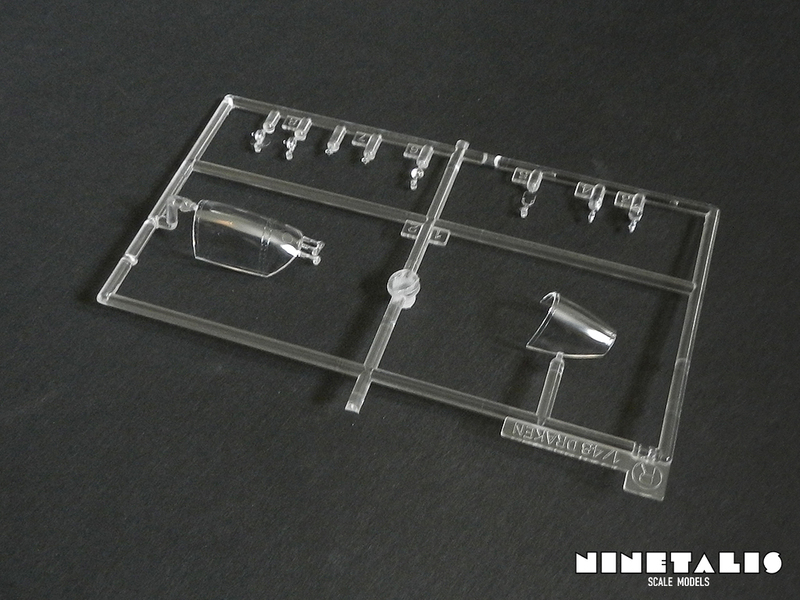 Inside we can find six styrene sprues, one clear sprue, a leaflet and a decal sheet. 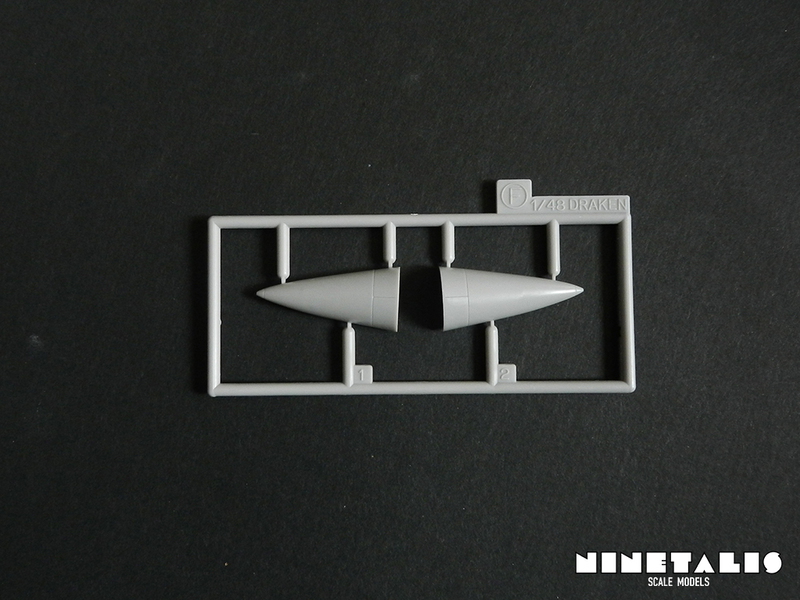 When examining the contents, we can find that some small pieces came loose from the A sprue, as well as a few points where the fuselage is connected to the frame. The details are very crisp, consisting from light recessed panel lines in the quality that we are used from the manufacturer, and no flash can be found on any of the parts itself. 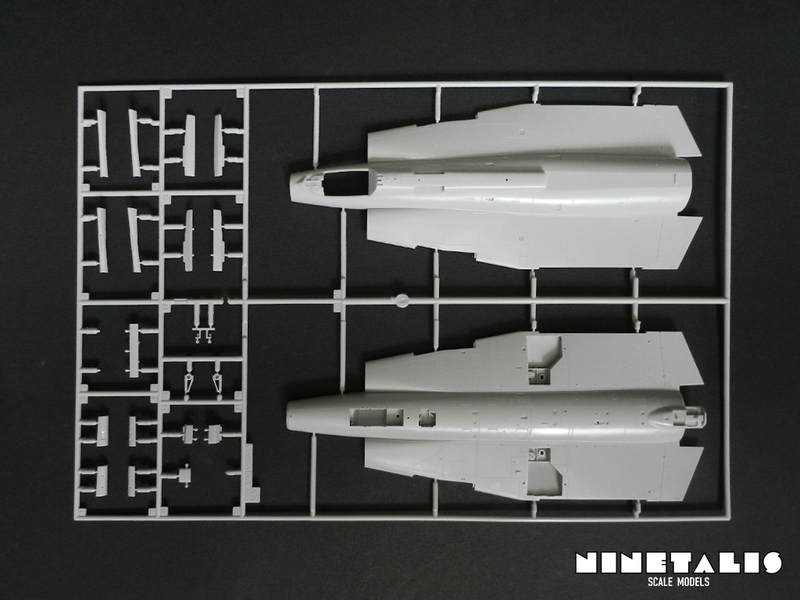 The A sprue holds the top and bottom half of the fuselage. It seems like a good way to divide them instead of a left and right fuselage half, which would have added a lot more work and complications for the modeler. 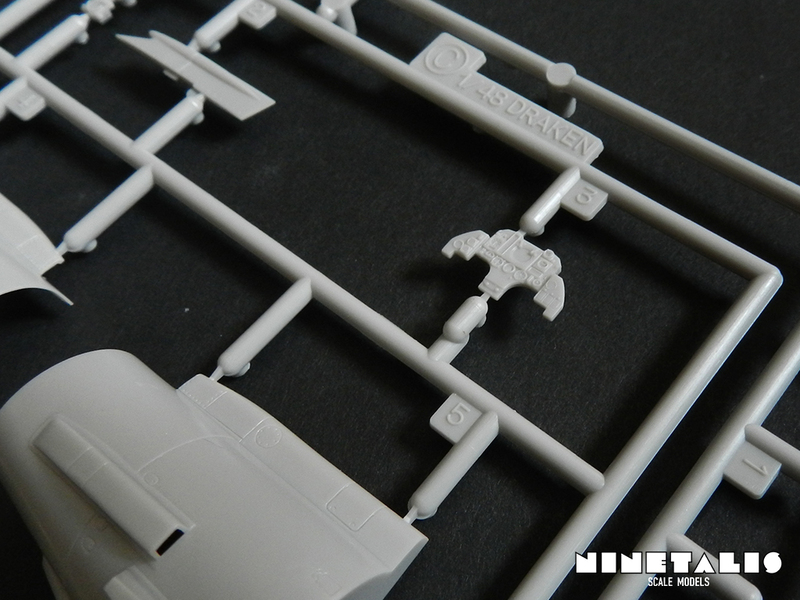 A few more detail parts can be found on the sprue, some of which seem to have come loose during its shipping. 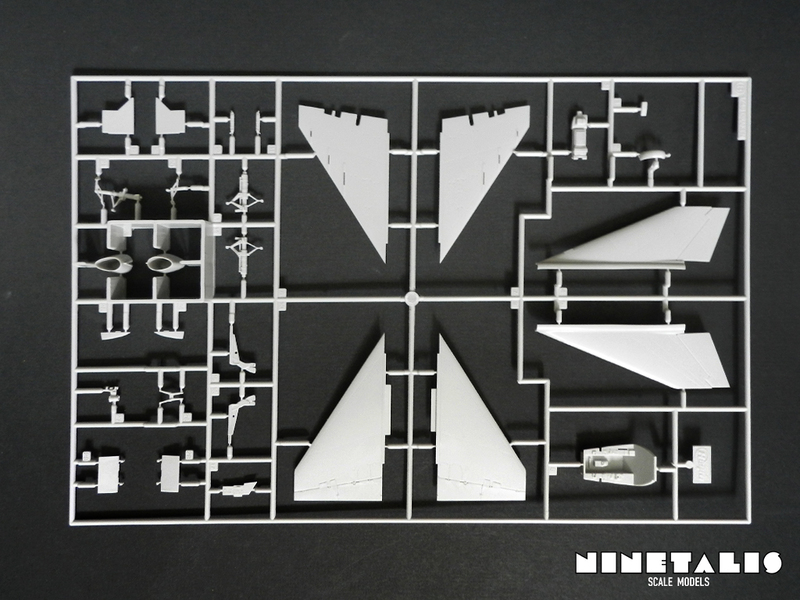 The B sprue holds various important items like the tail, wing tips (remember that double-delta thing? ), front landing gear, cockpit, pilot seat and engine intakes. 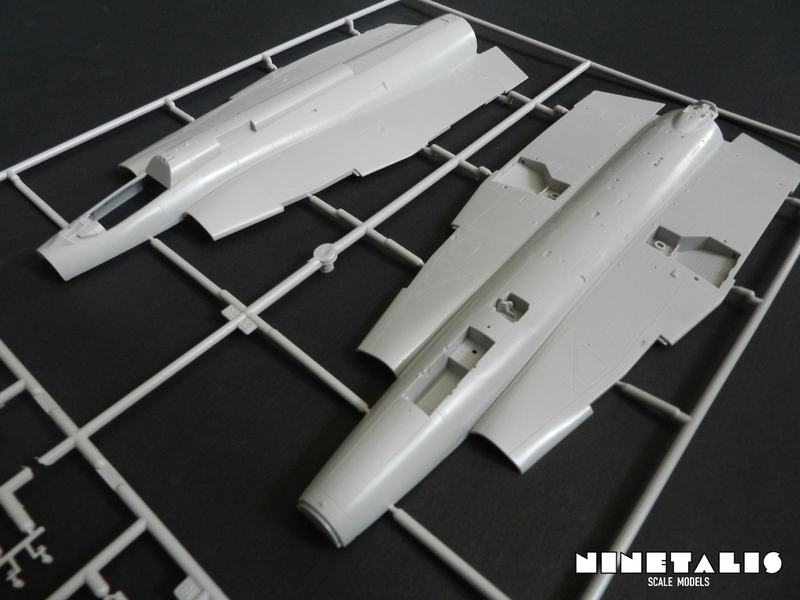 What stands out is that the engine intakes are surrounded by a thick wall of styrene, providing protection to them. It does seem to do its job, as I cannot see any visual damage to the parts. 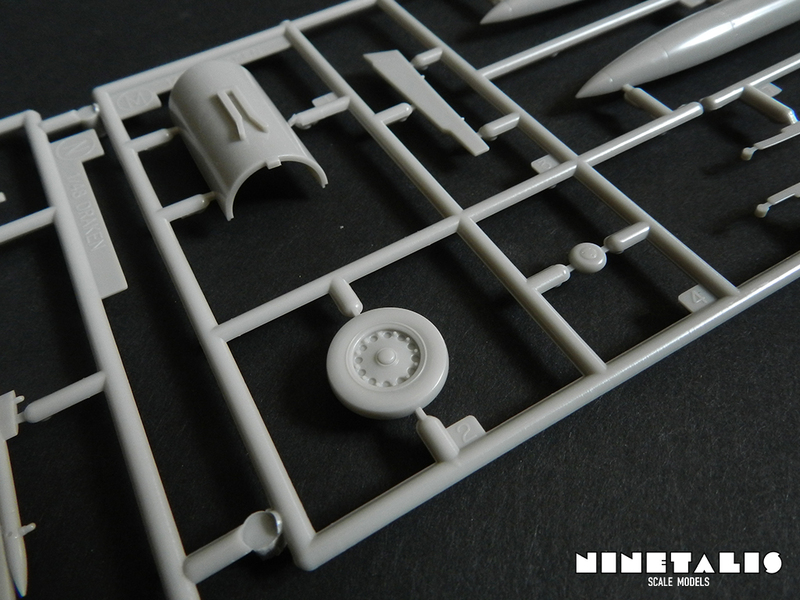 Further examination of the sprue tells that other venerable or detailed parts seem to be placed on this sprue, like the front landing gear. Last thing to note here is that the cockpit part is quite detailed and has raised details depicting the various panels, switches and knobs. 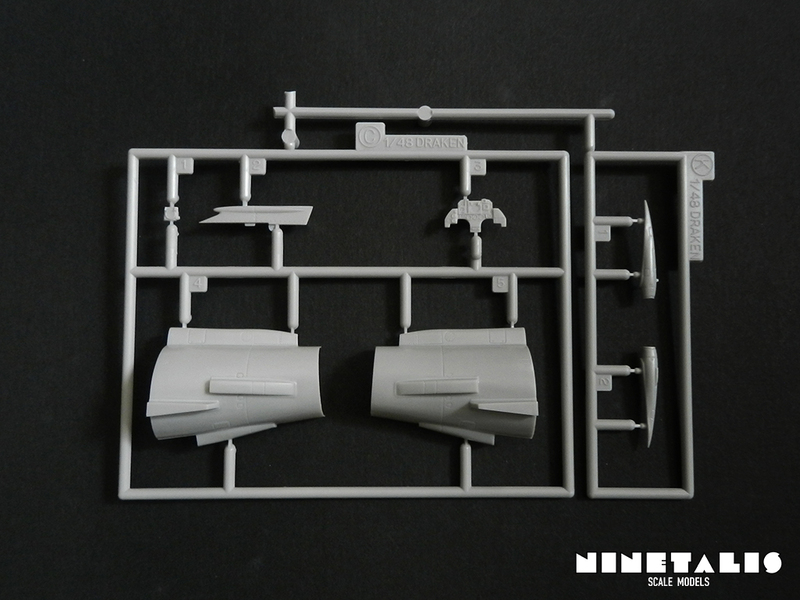 The C sprue holds the instrument panel and the outside of the exhaust. The instrument panel has raised lines and details depicting the instrument meters and indicators. The K sprue holds the IRST (the infrared search and track sensor) which goes under the nose of the aircraft, and is divided into two parts. In the instructions the part is examined more closely, providing the details to paint it in the right colors. 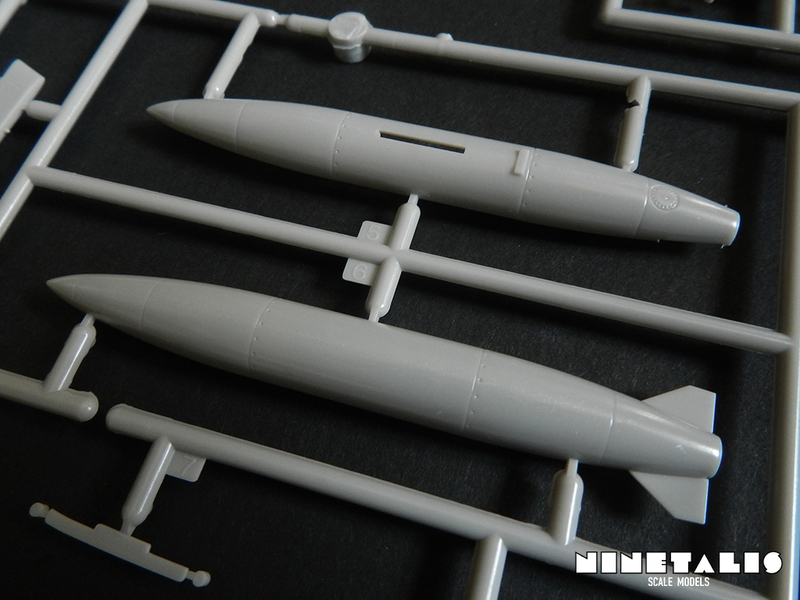 The F sprue is the smallest sprue in the kit and just holds the nose cone, divided into two parts. 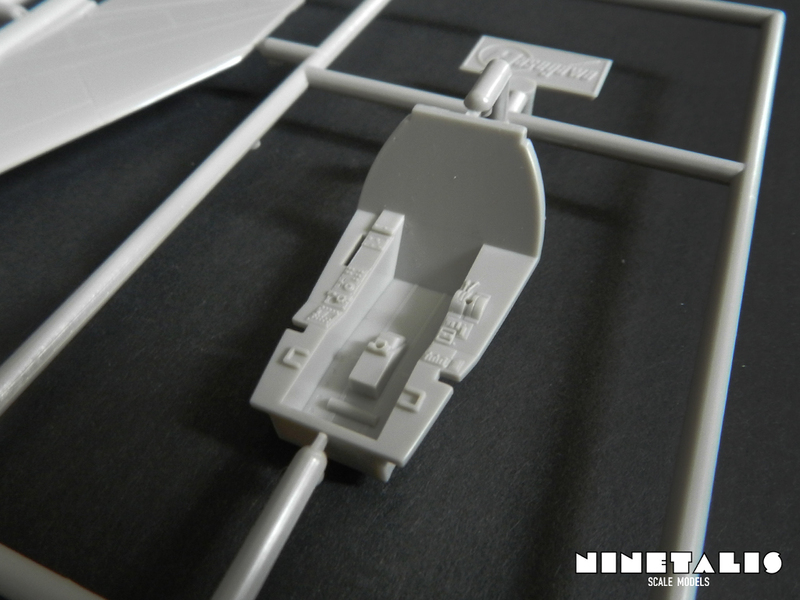 These sprues hold all the leftover bits that you need to build the aircraft. They hold the wheels, hard points, drop tanks, the exhaust and other small details. 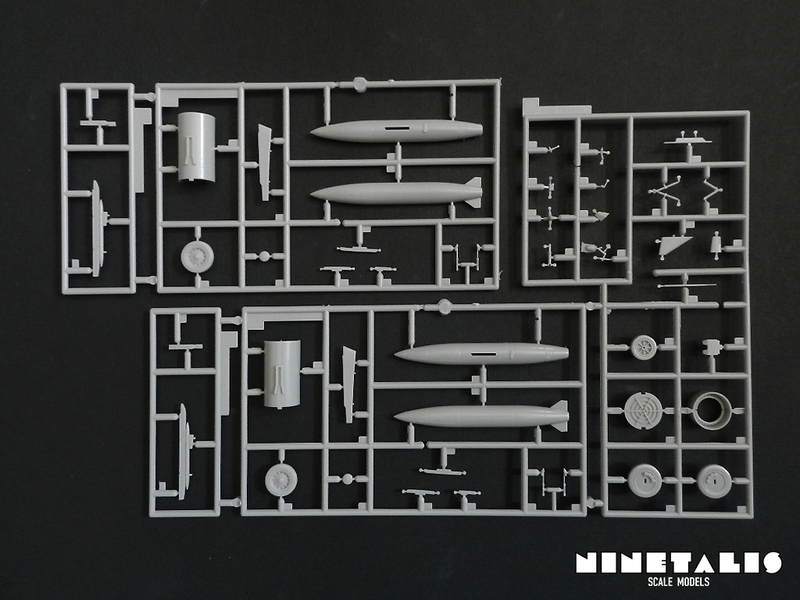 Sprue M and N are included twice, as they each hold one single drop tank. Noting that these are also the final styrene sprues from the box, it comes to mind that there are no weapons included with the kit. This is a bit sad but at least we do have some drop tanks to hang underneath the fuselage. 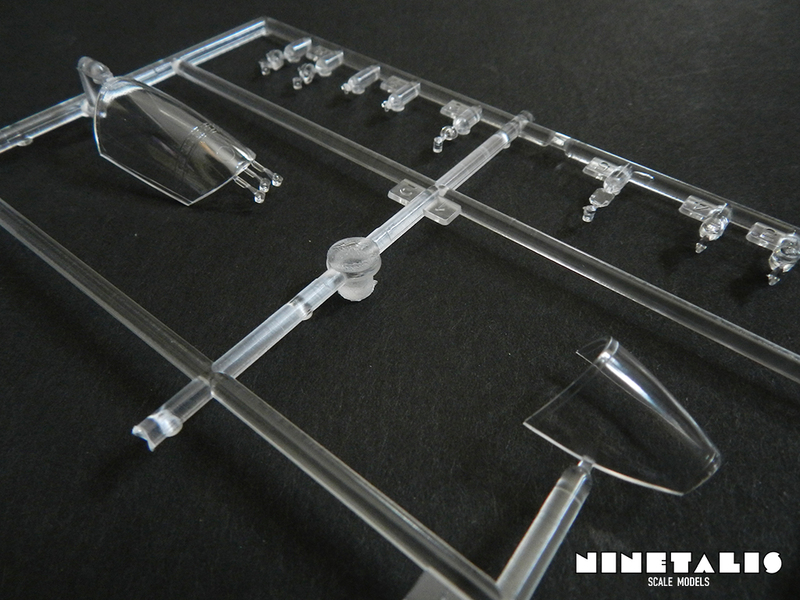 The clear sprue holds of ten of the 110 parts included inside the kit. The canopy is split up in two parts, while the other are all small lights. The parts were bagged together with the decals (a smart way to reduce plastic bags) and even as the largest part of the canopy hangs a bit loose, everything is completely scratch-free. This is the only place where the kit fails in my eyes. The decals have obviously not stood the test of time well (even for a kit that has just been released in 2008) and some seem to have lost their color a little. Not only that, but the decals aren’t exactly detailed and the clear overprint is quite large. A good thing is that even the large numbers that are supposed to go on the wings are present. For somebody who likes his build to go a bit easier, this is good, but a serious modeler should definitely mask and paint these numbers. The instructions are about the size of an A4 sheet of paper and folds into a leaflet. 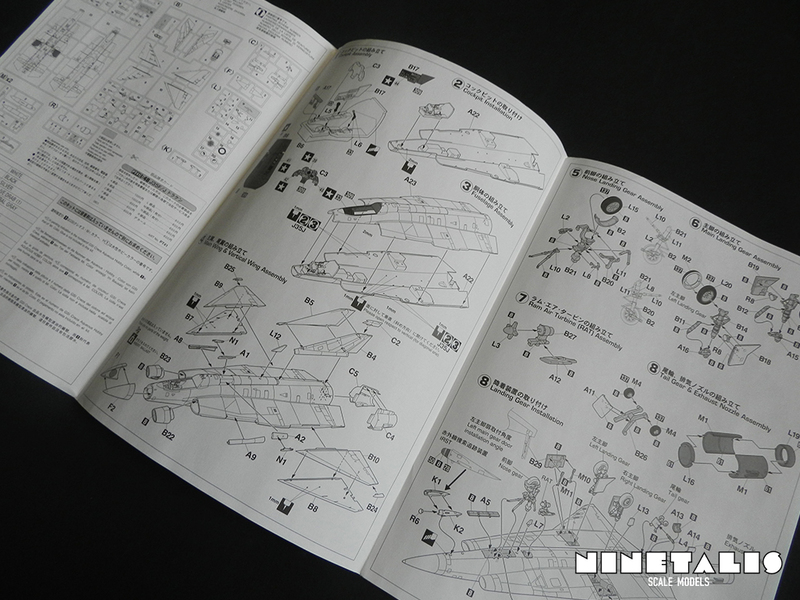 They sport the usual type of illustrations we can find on Hasegawa instructions. When taking a quick look at the steps that are being provided, it seems as if they forgot the addition of the pilot seat when placing the fuselage. For some reason they stall the placement until the last moment and it’s not really apparent why. This is not really bad or anything, but it leaves me a bit puzzled, as I’d just do it right after I placed the cockpit. 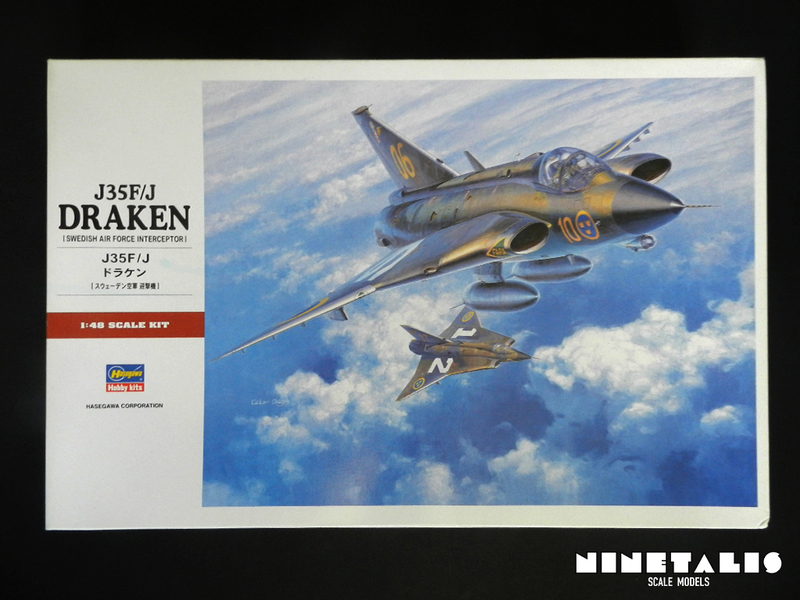 Hasegawa provides us with a choice of three markings. Two of them are tri-color camouflage schemes and one in it’s dual grey tone paint scheme. They all sport giant letters on the top part of the wing. With the camouflage Drakens these are white, while with the grey color scheme they are fluorescent orange. 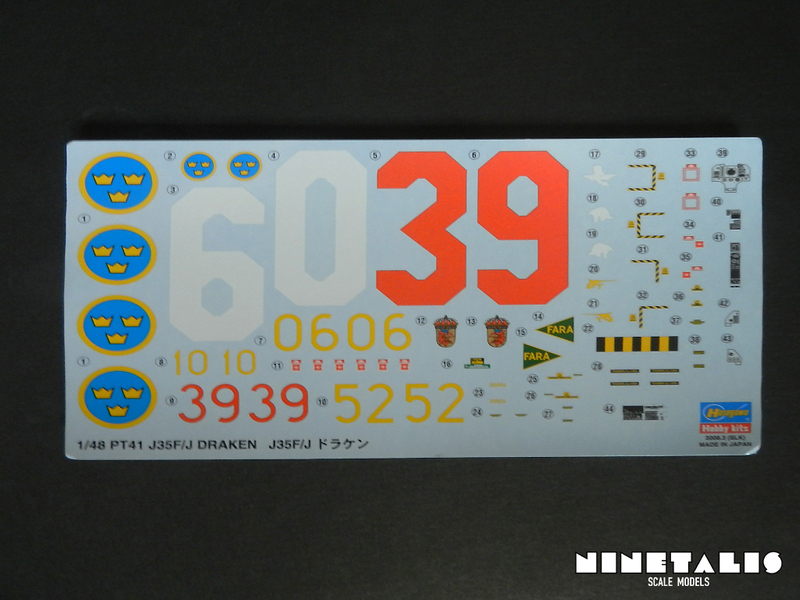 It is nice that Hasegawa gives us the option to do either one of the typical markings the Swedish air force used. Like this, the kit is interesting for either people who love camouflaged jets, as well as for the people who are more into the usual grayish schemes. Even the grey scheme isn’t ‘boring’ here, as there are bright orange numbers on top, which make the model stand out. 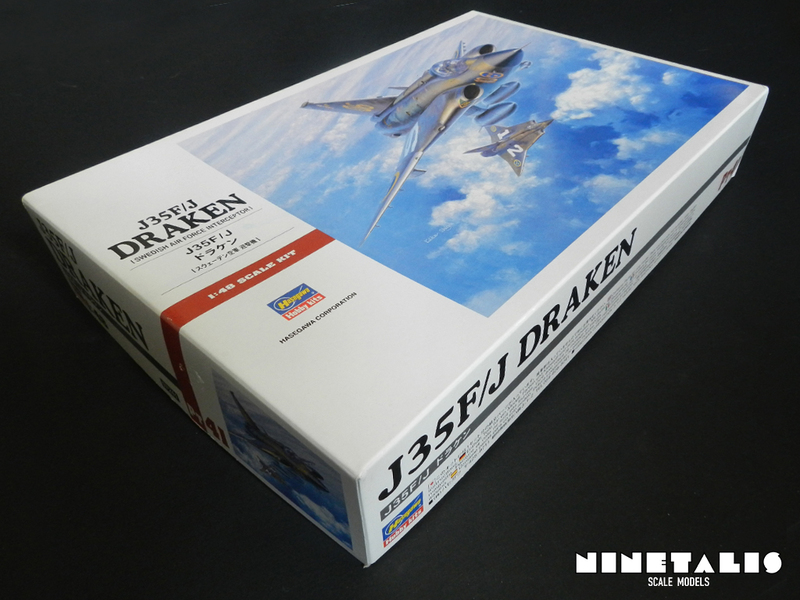 This is another nice kit from Hasegawa to add to the collection. It’s good to see that Saab aircraft are getting the attention they deserve, as they build pretty awesome jets. The Draken is an aircraft that every jet fan should have, it has been used since the mid-50’s until the halfway 00’s (something a lot of fighter aircraft can’t say at all), it has a very odd shape due to the wings and can sport camouflage schemes, grey tones and even a silver finish to be historically accurate. This kit provides us with the first two types and I see no reason why anyway wouldn’t get it. I’ve test fitted some parts so far and they fit perfectly, they detail is very nice and seems to be accurate. The price isn’t that bad either, being somewhere between 30-40 bucks and maybe even less if you’re lucky. The only downside of the kit is that there are no weapons included and that the decals don’t really seem to stand the test of time. 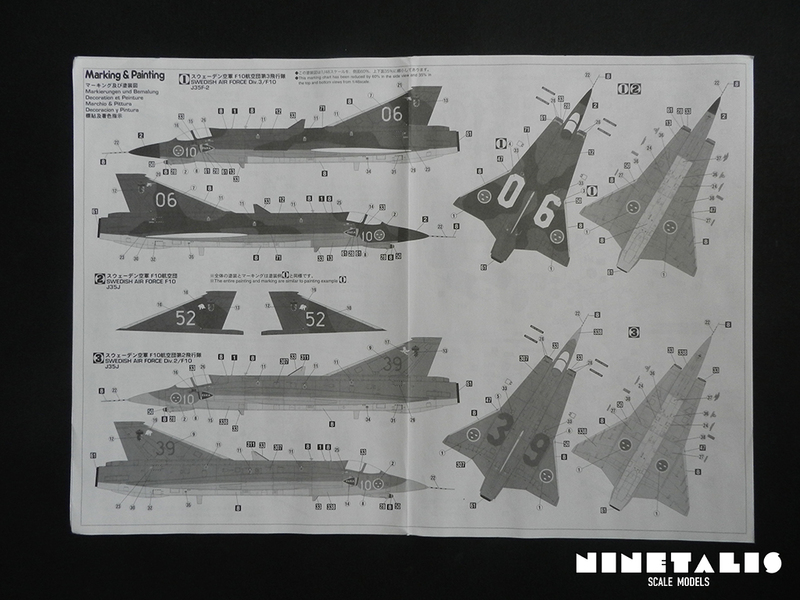 There are a few after market decal sheets you can get though, and Hasegawa has released a good amount of limited edition kits that might have better time-withstanding decals. Definitely recommended for everyone, especially those into Cold War jets.